Daily Penny Stocks Reviews - Legit or Scam? Daily Penny Stocks Reviews – Legit or Scam? 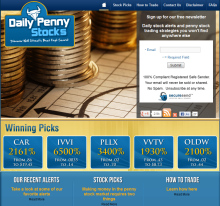 Daily Penny Stocks is an email service for people who are interested in day-trading and investing in penny stocks. The source of information and guidance you receive from the content in each email is there to help you maximize your profit potential from penny stocks. Daily Penny Stocks newsletter is also popular amongst new penny stock traders who want to learn the ins and outs of penny stock trading. Penny stocks consist of small cap stocks, primarily below $5.00/share, most often traded off market. They are highly volatile investments so it has been suggested to invest only what you can afford. Large cap stocks are different than penny stocks, large cap stocks are usually held onto for a long period of time. Penny stocks, on the other hand, are considered short term stocks and should be sold at a predetermined stop-loss amount or when you feel you have made a decent profit. Yes, penny stocks are extremely unpredictable but some of them have the potential to earn you a large profit in a fairly short amount of time. It is free to sign up for Daily Penny Stocks emails; at least 3-4 penny stock ideas will be included in those emails every week. They may send only 1-2 stock ideas a week if they do not find penny stocks worth noting. Not all of their recommendations are profitable and the successful traders usually make a smaller amount of money with each investment, the numbers can add up quickly if you strategically invest and know when to sell. Daily Penny Stock’s team is composed of individuals who are highly knowledgeable, have years of trading experience but are not licensed investment advisors. Their newsletters contain trading tips, advice, stock reports, emerging sector information, and new penny stock listings. It is important to conduct additional research about new penny stock companies and seek further advice from a licensed professional. Not only should you research the new penny stock options but it is also important to research the penny stock sites that could possibly have interest in the stocks they are presenting to you. It takes time and practice to understand the logistics behind investing in penny stocks, start off slowly before taking a leap. Average Rating for " DailyPennyStocks.com " is 1 out of 5 based on 3 reviews. If anyone has any advice on reputable investment companies/brokers please contact me [email protected] I am an open minded person with commonsense. I have followed this scam website for a few months now. Have only seen ONE stock he pumped where it might have made a few bucks for the tiny investors he has following him. The rest didn't even raise a half cent over the whole day. Most of them tanked as soon as he gave the green light. STAY AWAY! You can make money by doing your own research on small penny stocks. I've won, I've lost. But I have no one to blame or credit other than myself. This cheeseball is the red faced alcoholic you see on the side of his website at the bottom of his fake testimonials.. claiming to be a happy investor. Nope.... its him. I looked at all the stocks Daily Penny Stocks recommended and all but one crashed after it hit the price they brag about on their site. The one that didn't was at .89 in 2009 before they recommended it and has slowly climbed. Their advice was about 3 years too late. Don't listen to these scum bags, they will take all your money and leave you with trash stocks like TAEC. This place is a scam. I took there advice and invested in a stock... They don't release the stock information until two minutes after the market opens. in the first two minutes they are giving the information to all the buddies they have and letting them buy out stocks. at 9:32 of the same day the stocks skyrocket to insane amounts and even displays day highs that the charts don't show. Today the day high on CNCT is .47... the chart shows it never went above .30. When you go in to buy these stocks they are already bought out by millionaire interests and you are just the sucker spiking the stock so these guys will sell as soon as you buy. Don't trust Darth Trader or his website... the percentages and gains may be correct but it's only for his buddies. The reviews also show pictures of his buddies. It also states on his website if you invest in anything he suggests be prepared to lose your money... well take the advice of this place... they aren't kidding.